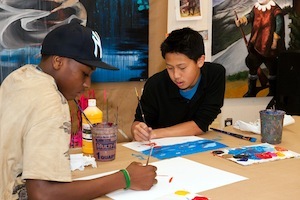 Horace Mann offers a rich variety of artistic experiences in all divisions. Arts offerings grow in number and complexity as the students’ abilities mature and their artistic skills strengthen. One important goal is placing the arts in historical, cultural and social contexts while at the same time stimulating the development of personal vision and self-expression in our students. Students are encouraged to expand their understanding of worldly phenomena and to process and transform their experience through music, dance, action and/or visual representation. Students develop creativity and innovation, personal style, observational skills and an awareness of multiple perspectives. In the Visual Arts, students are guided through a program that balances the development of technical skills and conceptual ingenuity. Children are exposed to a rich variety of media starting in the Nursery Division, where the focus is on exploration of materials in 2-and 3-dimensions. Formal art instruction begins in the Lower Division. In the Middle and Upper Divisions, course offerings increase in sophistication and specificity to include more formal and focused work in photography, sculpture, ceramics, print making, drawing and painting, video and film production and multimedia studies. The Music program encourages students to develop a love and appreciation of music. In the Nursery and Lower Divisions, instruction incorporates physical movement and rhythm instruments. Students are exposed to elementary recognition of notes and rhythmic patterns as well as listening skills. Formal study of instruments is introduced in the Lower Division. Students may continue instrumental instruction in the Middle and Upper Divisions. Advanced topics in the history and appreciation of music, music theory, and the use and influence of technology help students to enhance their understanding of the art. Dramatic play and movement activities are an important part of both the Nursery and Lower Division programs. Formal instruction in dance and theatre begins in the Middle Division. Theatre and Dance provide students with an experience of physical and vocal freedom and coordination. Through instruction and direct experience, students acquire the tools of stagecraft, appreciation of history and style, and the confidence to create plays, set designs, choreography and dramatic characterizations.